Students, professors and general readers alike have relied upon the Oxford Annotated Bible for essential scholarship and guidance to the world of the Bible for four decades. Now a new editorial board and team of contributors have completely updated this classic work. The result is a volume which maintains and extends the excellence the Annotated's users have come to expect, bringing new insights, information, and approaches to bear upon the understanding of the text of the Bible. The new edition includes a full index to all of the study material (not just to the annotations), and one that is keyed to page numbers, not to citations. And, to make certain points in the text clearer for the reader, there are approximately 40 in-text, line drawing maps and diagrams. With the best of the Annotated's traditional strengths, and the augmentation of new information and new approaches represented in current scholarship, the Third Edition will remain the reader's and student's constant resource. 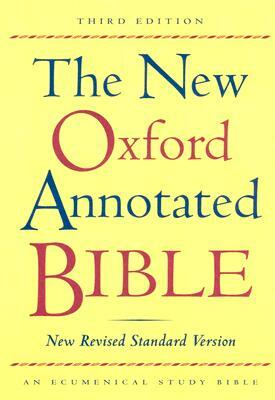 Description: Students, professors and general readers alike have relied upon the Oxford Annotated Bible for essential scholarship and guidance to the world of the Bible for four decades. Now a new editorial board and team of contributors have completely updated this classic work. The result is a volume which maintains and extends the excellence the Annotated's users have come to expect, bringing new insights, information, and approaches to bear upon the understanding of the text of the Bible.The new edition includes a full index to all of the study material (not just to the annotations), and one that is keyed to page numbers, not to citations. And, to make certain points in the text clearer for the reader, there are approximately 40 in-text, line drawing maps and diagrams.With the best of the Annotated's traditional strengths, and the augmentation of new information and new approaches represented in current scholarship, the Third Edition will remain the reader's and student's constant resource.Hardcover. Near fine. Third Edition. An Ecumenical Study Bible. Full refund if not satisfied.